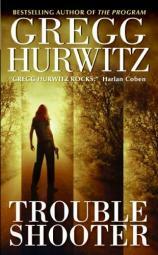 If the year 2005 becomes known as "The Year of Hurwitz,"
will prepare you for the masterpiece that is TROUBLESHOOTER. takes, and bringing the Sinners down. director, even as these elements merge and intersect as the U.S.
California but also national security. over-the-shoulder view of a counterculture within a counterculture. demonstrated here, is more parasitic than symbiotic.